The world's first ever operational jet fighter, the Me 262 would arrive to late to make a difference in the air war of World War 2. Although faster than the piston engined aircraft of the time, the Messerschmitt Me 262 was very vulnerable at low speeds. During the Autumn of 1938 BMW were working on axial flow turbojets each capable of developing 1,323lb of thrust and these were planned to be ready by December the following year. With this in mind Messerschmitt were requested to design a plane to use these engines. Designated P.1065 featuring tailwheel landing gear and originally featured engines in the wing roots, before being moved to under the wings, a top speed of 599 mph was predicted. 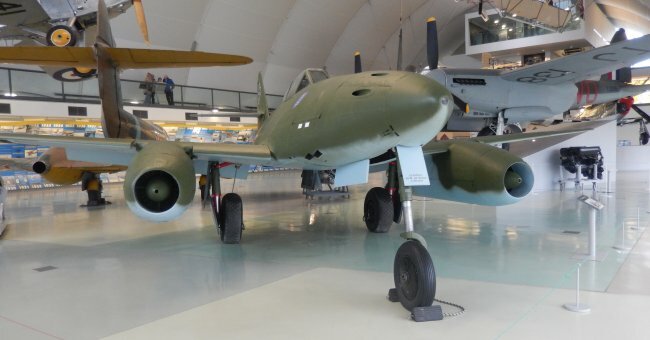 Designated the Me 262 three prototypes along with a static test airframe were ordered, however when the prototype flew for the first time on the 18th April 1941 it would be powered by a Jumo 210G piston engine positioned in the nose. This was due to problems with the BMW engines which were giving less than half of the predicted 1,323lb of thrust and the Junkers Jumo 004 jet engine was also experiencing problems. In this guise the plane was tested to make sure various systems in the aircraft worked, then seven months after the prototype flight the first of BMW's 003 turbojets arrived and were installed alongside the original Jumo piston engine. However the turbojets failed just after take off and it was the Jumo engine that allowed the pilot to land safely. 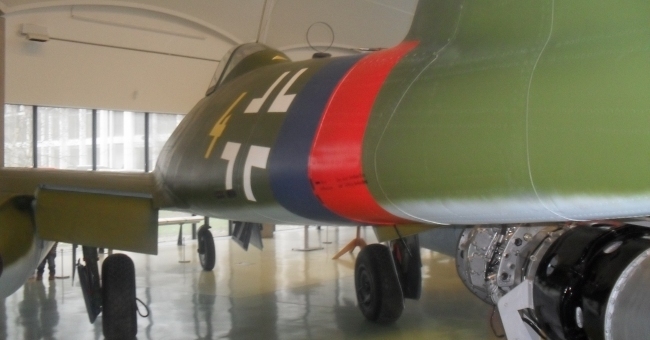 The failure was due to compressor blades which need a compete re-design a delay which resulted in the Junkers Jumo 004A being used and due to this engine being both larger and heavier the Me 262 had it's airframe modified. 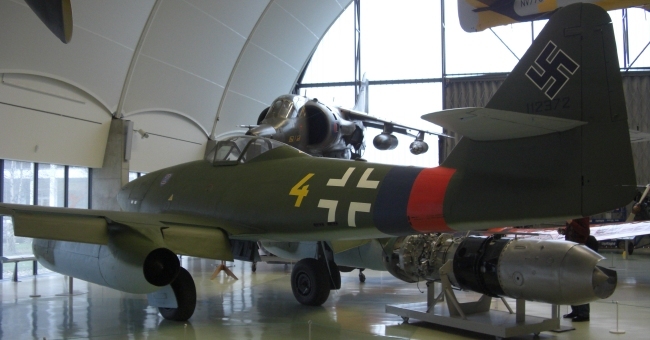 The first prototype of the jet Me 262 took place on the 18th July 1942, nearly nine months before the British Gloster Meteor, with a pair of 1,825lb thrust Jumo 004A engines providing the power. Testing of the new jet fighter continued and the tailwheel landing gear was replaced in favour of a tricycle landing gear and 1,984lb thrust Jumo 0048-1 engines were installed and sixteen months later the new aircraft was demonstrated to Adolf Hitler who gave the plane top-priority production status. Hitler had seen the Me 262 as a fighter-bomber but Messerschmitt were not 100% behind using the aircraft in this role but had very little choice, so different bomb racks were tested with bomb loads of upto 2,205lb being tested. 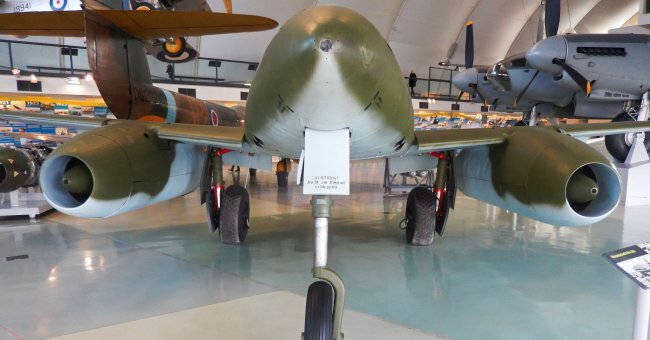 Before the Me 262 could be put into production a number of issues still had to be resolved and even when this was achieved the Me 262 had to compete with the Arado Ar 234 Blitz for jet engines meaning that the built airframes had to be stockpiled. By April 1944 production was able to start but for the three months between June and August only 107 would be built. 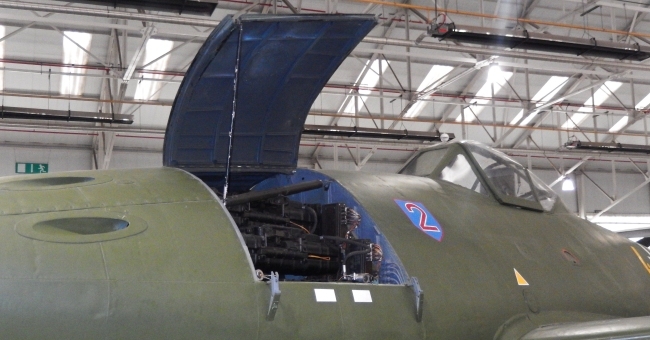 July 1944 saw the Me 262A-1a fighter begin to enter service with four 30mm Mk 108 cannons positioned in the nose. A number of sub-variants were also produced including the Me 262A-1a/us reconnaissance version with a pair of Rb 50/30 cameras. 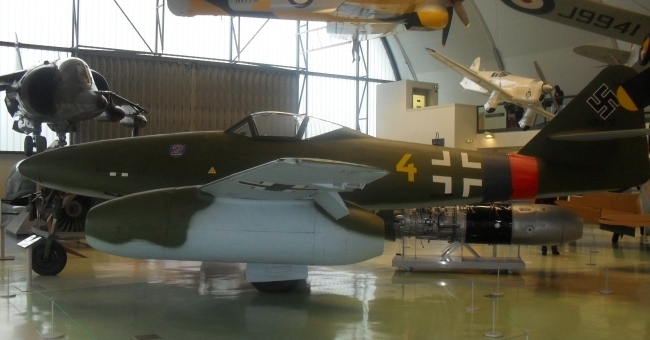 A two-seater trainer version designated the Me 262B-1a was produced and this lead to the Me 262B-2a night fighter, however the war ended before this Mk could be developed. Operationally the Me 262 was of course faster than pistoned engined Allied fighters of the time, although both the North American P-51 Mustang and Hawker Tempest did score victories over the aircraft, although at low speeds it was vulnerable and was not as manoeuvrable as piston engined Allied fighters. It wasn't until March 1945 that large scale attacks could be mounted by the type. When production ended 1,430 Me 262s had been built and had the aircraft arrived earlier the air war over Europe could have been very different. Me 262 B Trainer version. Me 262 C Two prototypes one a C-1a the other C-2b. 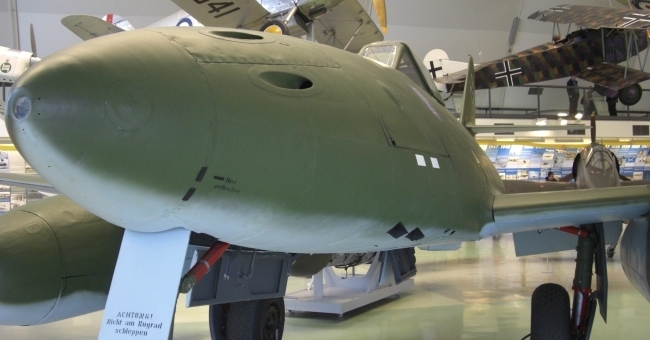 Me 262 D Intended to carry Jagdfaust Mortars. Me 262 E Two versions planned, the E-1 based on the A-1a and the E-2 intended to carry 48 R4M rockets.